David Cameron is expected to ask US President Barack Obama this week to put pressure on social networks such as Twitter and Facebook to help UK intelligence agencies monitor the online activities of hardline Islamists. During talks in Washington due Friday morning, the British prime minister will seek Obama’s support for his plan to deny terrorists a “safe place” on the web. Cameron, who will be the first European leader to meet Obama since the shootings in France last week, will outline a series of demands relating to US tech firms’ storage and use of online data. Reflecting on the terror attacks in Paris, Cameron said Tuesday it was vital that UK intelligence agencies get access to encrypted online communications of suspected terrorists. He argued that American internet firms such as Facebook and Twitter should be doing more to facilitate the surveillance efforts of UK government spy base GCHQ. At present, both Facebook and Twitter provide a platform for encrypted communications that can’t be unscrambled by intelligence officers. While the US Justice Department and Whitehall have previously sought access to such encrypted data with official court orders, both requests were rejected amid privacy concerns. Previously a niche policy concern, encryption has been catapulted onto the forefront of international debate following the disclosures of whistleblower Edward Snowden. Snowden’s leaks, which uncovered invasive mass surveillance practices of US and British intelligence agencies, roused widespread concern from privacy rights advocates. Following the whistleblower’s disclosures, tech firms such as Apple, Google and Facebook introduced new measures to ensure spies could not access users’ data without court approval. Facebook’s WhatsApp messaging platform began using a ramped up form of encryption in 2014 that even WhatsApp staff are unable to unscramble. Apple, likewise, attracted criticism from America’s FBI in 2014 when it publicly announced its latest iPhone software could prevent law enforcement officers from accessing information stored on a suspect’s phone, even if they possess a search warrant. Obama is due to broach the issue of data security in his final State of the Nation address next week. The scheduled US-UK talks mark Cameron’s last bilateral summit abroad prior to May’s general election. The PM will arrive in Washington on Thursday, and will dine with Obama at the White House in advance of Friday’s talks. The two-day trip was originally intended to bolster Cameron’s image as a powerful statesman in advance of May’s election. But in the wake of the Paris shootings, it will be characterized by a more sober tone. Al-Qaeda has claimed credit for the Charlie Hebdo massacre, though Western intelligence officers are yet to substantiate this claim. Civil liberties group Privacy International (PI) warns that Cameron and his Conservative party are guilty of “cynical opportunism” in the aftermath of the French terror attacks. “Government officials ... rally in the name of freedom and human rights claiming that the terrorists will never win and hate us for our freedoms. Then moments later ... they attempt to curtail our rights they boldly proclaim in public as unassailable,” a spokesman for the group said. The PI spokesman stressed the eradication of encrypted technologies and spaces on the web is beyond Britain’s capabilities. “The UK simply cannot command foreign manufacturers and providers of services such as WhatsApp or Google Hangout to modify their services to accommodate the desires of British spies,” he said. On Wednesday, however, UK Home Secretary Theresa May told MPs all safe havens for online terrorist communications must be eradicated. She stressed it was likely France’s counter-terror investigation in the wake of the Charlie Hebdo massacre relied on access to communications data to locate the suspects. 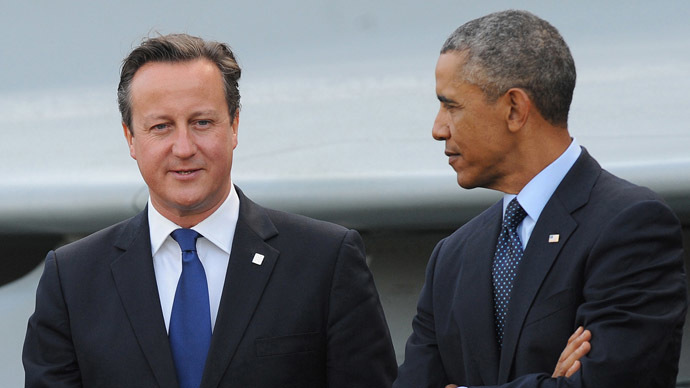 In their talks, Cameron and Obama are also expected to discuss trade, the world economy, counterterrorism, the West’s military campaign against Islamic State, Russia and Ebola. It is also predicted that PM Cameron will put pressure on Obama to sanction the release of Shaker Aamer, the last remaining UK resident detained in Guantanamo. The detainee’s lawyers fear his life will be in danger if US authorities deport him to Saudi Arabia, where he was born. As Cameron made preparations to fly to Washington, evidence emerged that Aamer has been regularly beaten by Guantanamo guards. Video evidence shows the terror suspect, who has been imprisoned at Guantanamo for 13 years without charge, being assaulted by guards on 315 separate occasions.